cooking, Cucumber Salad, Mennonite cooking, Tangy Cucumber Salad, Whatever Happened to Dinner? For years I have made the same old cucumber salad, using the homemade all-purpose salad dressing I shared here, which I basically got from my mother. This summer I have already picked at least seven 5-galloon buckets of cucumbers from our patch of 10 plants and the season is just getting started. I’ve given most of them away, and we eat cucumber salad almost every evening. We had a staff potluck this week and of course I knew I would bring something cucumber-y, and then I wondered: what if I took my standard sliced cucumbers and onion, and used the tangy soy sauce-based dressing from Jessica’s Cabbage Slaw recipe, and added her toasted and slivered almonds, and then threw in sesame seeds just because it seems like something to go with soy sauce. It had to be good, didn’t it? It was. The proof? A woman I consider a great cook asked me for the recipe. I couldn’t find similar recipes readily online–most added garlic or other herbs but I wanted to keep this pretty plain jane. Slice salad ingredients into large bowl. 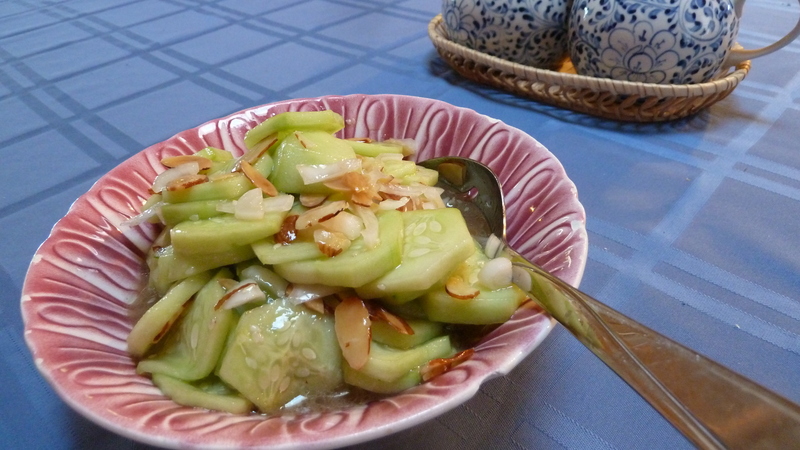 What’s your favorite way to serve cucumbers (other than raw or in tossed salads) in the summer when they’re plentiful? I’d love to hear about other recipes. There are two cucumbers in my fridge now, from the grocery store, not from the bounty of our garden as you are blessed with – I’ll have to see how many ingredients I have in my kitchen pantry before I start in on this recipe. It look dee-lish! I wish I could ship you some cukes. 🙂 I think I will leave the sesame seeds out another time, which I added mainly for “appearance.” I’m still eating leftovers 2-3 days later, but the sesame seeds swell up and now don’t look so appetizing. We do not have a vegetable garden . My father in law used to have a small patch that always yielded lots of cucumbers. I grew up eating lots of them in the summer both plain and in homemade cucumber sandwiches, which are stil my favorites! Although we don’t have any home grown ones, we still have cucumber with most of our main meals. I will try this recipe some time though It sounds good!. Did you put anything on your cucumber sandwiches, or just sliced cukes and bread. Any mayo, butter, other sauce/dressing? Also, are you saying you usually serve cucumber with most main meals–even in the winter? That’s interesting! Melodie Yes we made the cucumber sandwiches with butter and mayo. In the summer at the cottage when we had lots of company we wold make up large tray of sandwiches usually cucumber , egg salad ,fresh tomato with butter and mayo ,a favorites of my dad and husband , peanut butter with banana or tomato or onion . The kids liked their peanut butter with jam or honey. As for the cucumbers with our diner …This sort of started a couple of years ago when we moved .My hubby (who has never been onto do much in the kitchen) now helps me get the dinner ready There is a wonderful market nearby and we get fresh corn on the cob every night in the summer and we can buy the English seedless cucumbers grown locally in the summer and imported the rest of the year. It is his job to slice them and although you do not really have to peel them, we do because the skin irritates his stomach. Thanks Melodie, I copied the recipe! I wil try to fix it soon! Love, Bev. Like Caro-Claire we eat cucumbers year round. We grow lots in the summer to eat and make all kinds of pickles and relish. We buy them from the store the rest of the year, sometimes seedless, sometimes regular, whichever look better. Often I salt my cucumber slices for a day, then drain. Keeps them longer in the refrigerator. Last night we had sliced cukes with the end of a cruet of homemade Italian dressing that I added some balsamic vinegar too. Also finely chopped onion. The basis is always cukes and onions. Sometimes half n half and sugar and cider vinegar. Sometimes plain yogurt instead of cream. Sometimes just Italian dressing and chopped tomato added. I have never used a recipe. When we have finished a batch of 4bean salad I will slice cukes into the leftover sauce. We are making refrigerator dills and canning bread and butter pickles after dinner. We got things readied earlier today. We are getting lots of cukes also and I would like to try your recipe. Thanks for sharing. Do you have a garden at your new place? I’m impressed!